Today I have a small but amazing showcase with Adam Elford off Tales of Sigmar podcast. 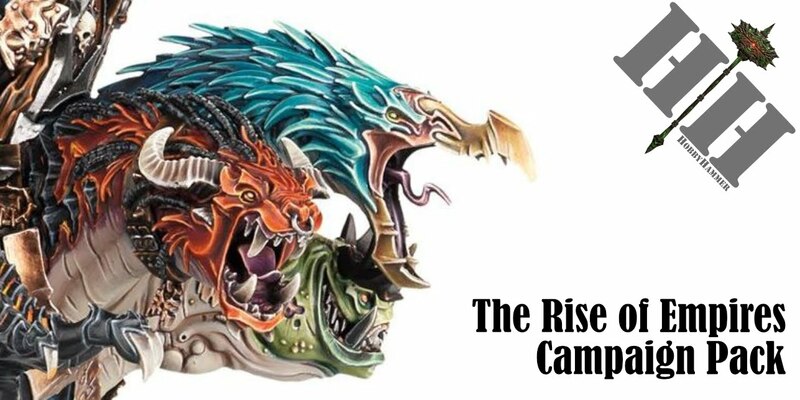 I have been following Adams work for a while, you may of seen his Lord of Change conversion and in fact his whole brush blended Tzeentch army. I had the opportunity to meet him in person a few weeks back as he came along to our club night to play some games, and therefore got to see his miniatures in person. I can tell you, they look fantastic in the pictures but this still does not do them justice to seeing them in hand. 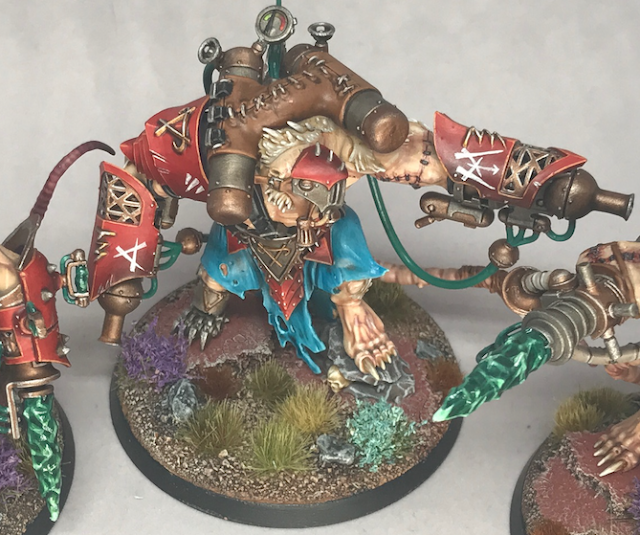 I had a little chat with him about some of his recent work on a Skaven army and it is below! Sean: Hello Adam! How are you? I'm good thanks, been busy working away on my latest army. Sean: Firstly, thank you for answering a few questions, I know time is precious to you as you are a bit of a Hobby Maniac (like myself). I have been following you progress on the new Skaven army. What made you choose Skaven as your next project? I still had loads of models left over from four 8th Edition armies I done and absolutely loved painting them. Once I started, they got my hobby juices flowing again. 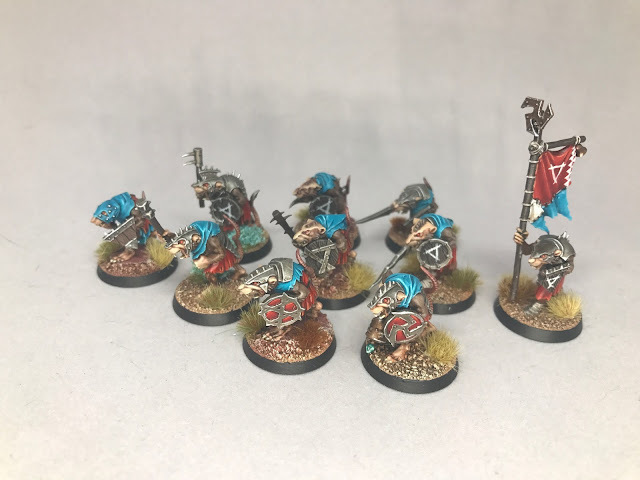 Sean: Your colours are not typical in regards to Skaven, this is what attracted me to want to do a showcase on them. What gave you inspiration to choose the colour pallet? I always liked the look of the red armoured models in the books and wanted to try that. The blue was just a nice contrasting colour to the red. Sean: I know you don't use an airbrush, but your blending work always looks like you have. How do you get such good blends between colours? It's very thin coats and gradual highlights. I start from a midtone, highlight it up. Then I shade it down and then create a glaze to tie all the blends in. Sean: If we take a Clanrat. 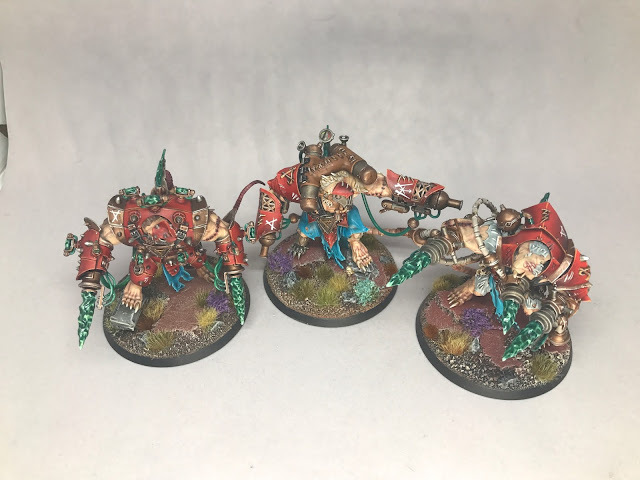 What is your process of painting the miniature, from start to finish? 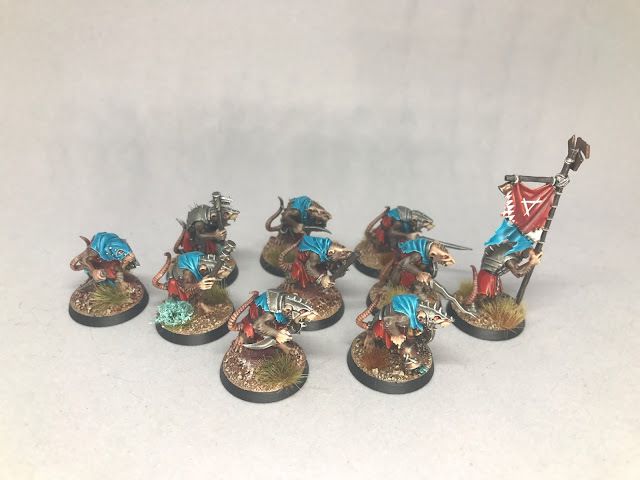 A clanrats is normally a staple to the Slaven army, so there is bound to be a lot of them. I start with a brown for all the fur (various browns amongst the unit) and then give it a dry brush. Shade this down and start the flesh. The flesh again consists of one of GW's base flesh colours, shaded with Agrax Earthshade or Reikland Fleshshade. Highlighted with Cadian then Kislev. I do little like highlights after with Pallid Wych Flesh. Metals are big standard Leadbelcher, shade and Runefang Steel highlight. Then I spend time on the parts which make the model pop, the cloth. 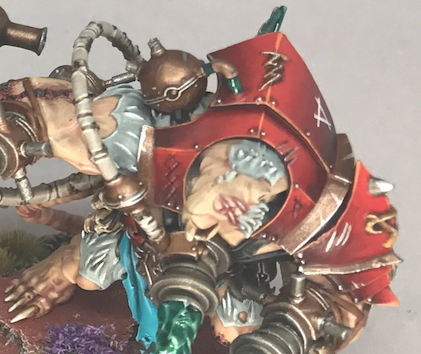 The red is Mephiston shaded with 50:50 Lahmium Medium and Nuln Oil. Mephiston Red, 50:50 Mephiston:Evil Sunz. Evil Sunz and then 50:50 Evil Sunz:Troll Slayer. I then glaze it with Bloodletter and Lahmium 50:50 mix and then final highlights with Fire Dragon Bright. The blue starts with Army Painter Turquoise, Ceolia Greenshade 50:50 with Medium. Then start highlighting up with the turquoise adding in small amounts of Ice Blue. I then glaze it with Guillimans Blue and Medium and then hit it with a final highlight of Ice Blue. Sean: So these originally started with Purple armour, what made you change your mind? While the purple armour looked nice, it just looked too dark for me. I sat the models across a table and looked at them and they didn't look right. I don't want my opponents playing against a dark boring looking army, so it had to change and brighten up. Sean: What tournaments have you got upcoming? 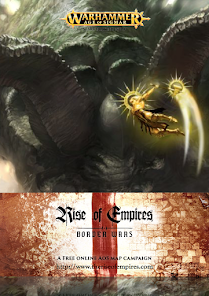 And more importantly what are your plans for the Realm Hoppers Narrative event in February? I've got Clash of Swords coming up in a few weeks which I'm frantically painting towards, and then Realms at War in November. I haven't sat down yet to think about the Realm Hoppers event, but I'm sure I can get a nice themed army ready. Sean: Do you get to play much outside of tournament play? What is the AoS scene like in your area? I've only played 3 games of AoS outside of tournaments. I work a lot so when I get time, it's mostly painting the models I love. 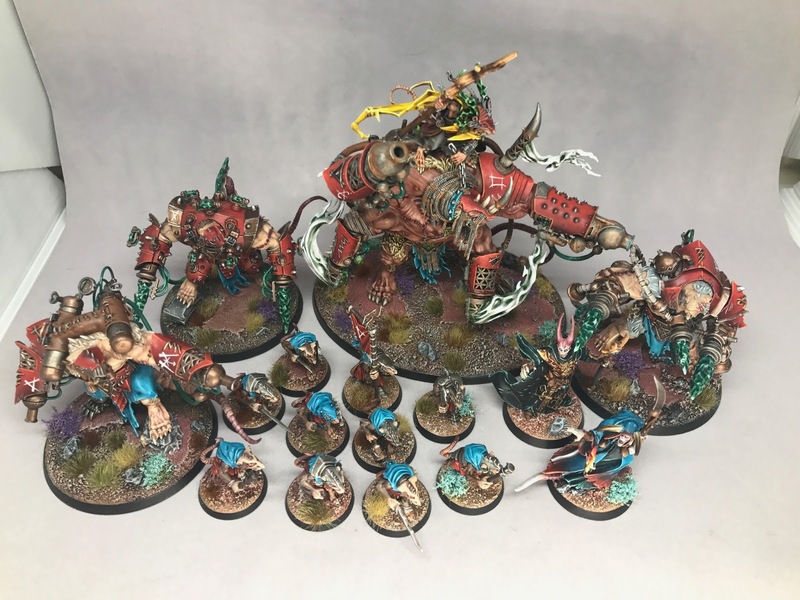 There is apparently a lot of players looking to get into AoS at the local club, they just need a push and me to demo a few games. So that will start soon with a bit of luck. Sean: Is there anything you want to promote or any final words? 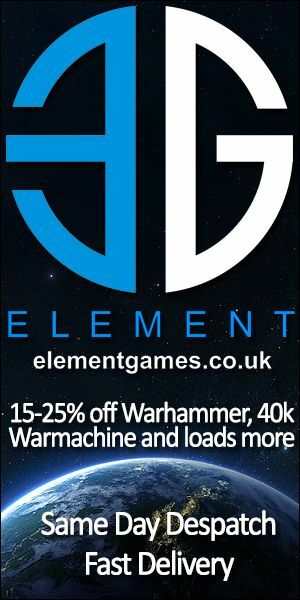 You can check out my Twitter @elfordminis or the podcast I co-host called Tales of Sigmar. Sean: Thankyou for your contributions to the community through your inspiring paintwork and of course the podcast Tales of Sigmar. I always look forward to seeing what you do next.